This past winter I was thinking, wouldn’t it be great if MobCraft brewed a barley wine? 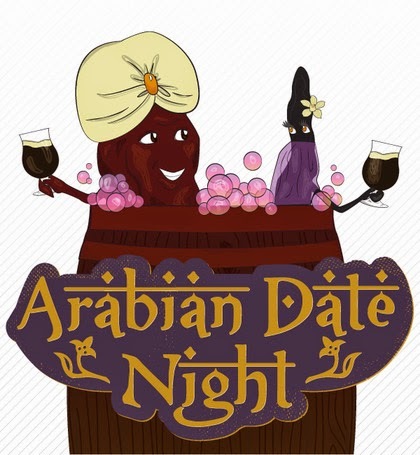 But wait, they do, and to make it sufficiently interesting to be a MobCraft beer, the Arabian Date Night English-style Barleywine, is brewed with Dates and Vanilla beans. As the March, 2014 winning recipe the guys brewed this, fermented it, and barrel aged it over the summer for a winter release. English-style barleywines often have dark fruit flavors that arise from the carmelizaton of sugars during the boil, with a few commercial barleywines boiling the wort (the liquid containing the sugars from the grains) for over two hours during the brewing process. Others use a combination of malts to replicate the flavors that come from extended boil times. Dates certainly fall into the range of flavors that can come from extended boiling, so to further enhance the flavor by adding dates during fermentation sounds like it would be a great plan to enhance the date flavors. Adding dates directly into the fermenting wort gives the yeast extra sugars to convert to alcohol while providing additional flavor. Adding vanilla beans should give the beer additional depth and complexity, which is again compounded by aging the beer in brandy barrels. On paper this sounds like an amazing barleywine, adding fruit after fermentation is complete can be a little dicey though and can lead to contamination. Either way, this sounds good. The beer itself is a 9.5% barleywine aged in brandy barrels for 6 months and then vanilla bean puree and date puree are added. 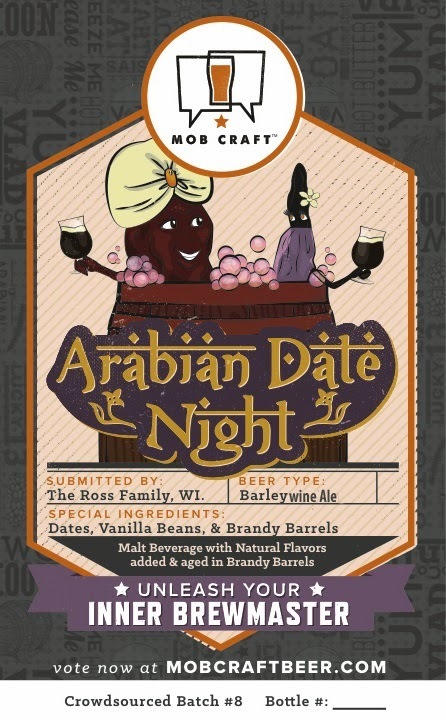 Arabian Date Night Beer also features Special B and Caramel Malts for a toffee like profile. Nose is reminiscent of caramel candy and the body is upheld by the dates. Sweet but not cloying. This beer should be served at 55 degrees or cellar temp and is most definitely a sipper. It has aromas of dried fruit and biscuits meld with woody overtones and delicate vanilla for a sipping brew that’s surprisingly drinkable. Arabian Date night pours a very clear light mahogany with black cherry and garnet highlights when held to the light. A thick, small bubbled, yellow-tinged than head caps the beer and holds very good retention (~5 min) before fading to a thick collar around the edges, and leaving behind a light spattering of lacing in the glass. Sweet caramel, dates, and vanilla lead the aroma with sweet alcohol and crème brûlée rounding out the middle. Dates and a slightly sour yogurt lactic note linger into the finish. The lactic sourness becomes more prevalent as the beer warms to room temperature, although out of the fridge it was restrained. Sweet alcohol leads in the flavor with notes of date, vanilla, and biscuit malts rounding out the flavor. A slight oak character comes through from the barrel with plenty of slightly sweet brandy to add additional complexity. A yogurt-like (lactobacillus?) sourness, brandy, and toffee round out the finish and leave a lingering sour aftertaste. The full maltiness and moderately low hop bitterness would have made this a great malty barley wine were it not for the unfortunate sourness. With a moderately full body and a moderate level of carbonation, the mouthfeel is smooth and silky. I really want to like this beer for the creative list of ingredients and the strong notes of date, vanilla, biscuit, toffee, and oak which were more prominent before the flavor became dominated by the lactic sourness. Unfortunately, lactic sourness is an off-flavor in a barley wine, and one that I can’t get past in judging this as the barleywine it claims to be. That’s not to say that I didn’t enjoy the experience of drinking a beer that was vaguely reminiscent of boozy, date-flavored yogurt. This is actually a very enjoyable sour, but the sourness seems to be a product of the late fruit addition rather than a flavor that was intended. Adding fruit after fermentation can be tricky because the yeast is no longer active to outcompete any unintentional bugs that may be added in. Heck, the bugs that caused the sourness could even have been active in the barrel and due to the short time that the beer spent in the barrel it was just not prevalent at the time Arabian Date Night was release (check out the post on CW 16 for more info on bugs and barrel aging). Well, that’s all for tonight, check back soon for another post. Black Vanilla IPA – Horny Goat Brewing Co.